Since major league baseball began in 1871, there have been roughly thirty million pitches thrown to batters. Only one of them killed a man. 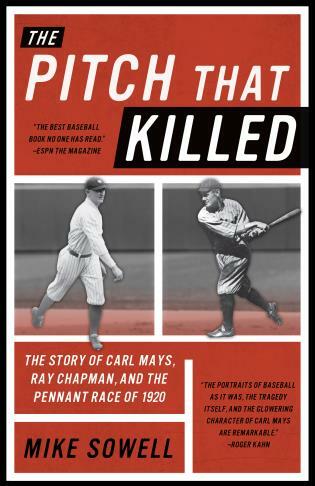 This is the story of Ray Chapman of the Cleveland Indians, a popular player struck in the head and killed in August 1920 by a pitch thrown by Carl Mays of the New York Yankees. Was it, as most baseball observers thought at the time, a tragic but unavoidable accident? Mike Sowell's brilliant book investigates the incident and probes deep into the backgrounds of the players involved and the events that led to one of baseball's darkest moments. Mike Sowell teaches journalism at Oklahoma State University. He has also written One Pitch Away: The Players' Stories of the 1986 League Championships and World Series. He lives in Stillwater, Oklahoma, outside of Oklahoma City.